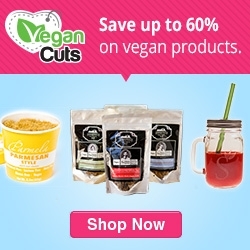 When I was offered to review the Vegan Cuts Monthly Snackbox, I was THRILLED. Seriously! Until this month, I have been drooling over them monthly, jealous of all the boxes I see arriving all over instagram. We were moving and I was livin' on limited funds, but now I have officially decided to dedicate the entirety of the monthly toilet paper fund to a Vegan Cuts box instead. Just kidding- we don't have a toilet paper fund. But I'm still setting aside a little monthly moolah to get this delicious delivery sent to me! I love trying new food AND getting mail, so this really is ideal. And it was so fun trying products we might not normally pick out at the grocery store. Now we have a few new favorites! They fit SO many scrumptious goodies into one adorable little package! I opened up the box to a list of the curated products, which this month got a help from Eco Vegan Gal. The full list included: A bag of lentil chips, a pomegranate oat smoothie by Oatworks, superfood oatmeal in espresso mocha blueberry, a pouch of vegan protein powder made with brocolli, an almond chocolate chip bar Nii bar, some NuttZo brand seven seed & nut butter, 2 packets of Numi savory tea, and a clear reusable glass straw. And while I really did like EVERYTHING they sent, I picked a few favorites. First up? Those lentil chips! A little strange at first, I quickly decided I liked the slightly salty chips exactly because they were pretty plain- and GREAT with hummus! It's hard to find a chip that seems so worth snacking, but I felt good about eating these and loved that they were gluten-free. In fact, the whole box was!My next favorite, or should I say MOST favorite, was the vanilla protein powder. Made from broccoli seed, I was a little worried it might taste "green", but it was one of the best protein powders I have EVER had! Not too thick, not clumpy, just smooth, rich, and full of flavor. I loved it and will DEFINITELY be getting a larger container of it! In fact, this was the one product in the box I didn't share with Alex. I drank it up before he even noticed...oh well, his loss! This sweet, chewy almond chocolate bar from Nii was the all around winner. I loved how simple the ingredients were and how filling it was, and Alex of course loved that it was packed with chocolate. Perfectly sweet with a little crunch- definitely a bar I'm not sure I would've picked out in the first place but would definitely buy again; That's the best part about the Vegan Cuts box! A bunch of stuff to try and fall in love with...or not. But for just $19.95 each month, you don't feel like this little splurge is really a splurge at all. And who doesn't LOVE getting mail?! I recommend getting your vegan booty over there and ordering yourself one right now. Oh, you're a raw vegan? A gluten-free vegan? Yeah, they're got you covered. Beauty more your thing? They do that too. Seriously, they ROCK. They also have a super cute, fun-filled online store full of fave products and some extra stuff, too. What're you waiting for? Like them on facebook, follow them on twitter, and order yourself a Vegan Cuts Box!